Instructions: Prepare a 5 x 7" white card base. Use the Intricate Swirl Frame and die cut one out of white cardstock. 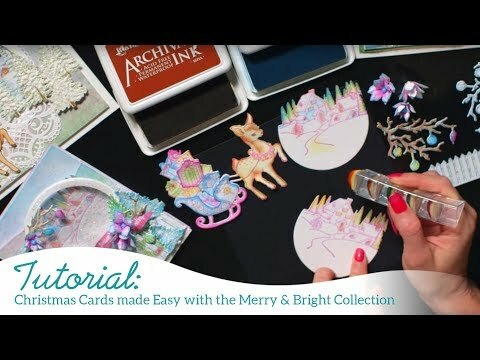 Locate a light blue background from the Merry and Bright paper pack, trim down to 4 x 5 3/4 and adhere to the card base. Adhere the Swirl Frame on top. Use the Gold ink and stamp the sentiment in the upper right hand corner. Die cut the corner die from the Frame a card Leafy Border out of white and adhere to the left upper corner. Stamp trees, leaves and flowers on white with the gold ink. Cut out using the matching die. Adhere the trees to the lower right side bottom. Adhere the Gold leaves to the center of the corner die as shown. Stamp the Poinsettia leaves on green cardstock with the gold ink, cut the flowers and leaves out with the matching die, place in the flower mold and run through the die cut machine. Glue one green leaf and 2 poinsettias together making one flower, make 3 white ones and adhere to card on the upper left corner. Stamp more Poinsettia leaves and flowers on white cardstock. The flowers stamp with the Red Geranium, color in with the Carnation red, ink the edges with the Vermillion. Stamp the leaves with the Olive, color in with the Leaf Green and ink the edges with the Emerald Green. Adhere to card. 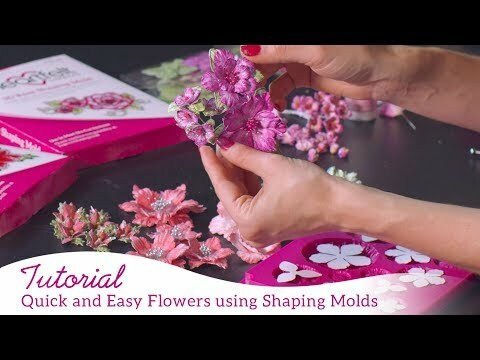 Use the dries clear glue and the Crystal Clear glitter on the Poinsettia flowers and leaves. On the white flowers place Prills in the center, on the red ones add stamens. Add the Dries white adhesive on the trees and white leaves, add the Frosting Powder to those to finish the card.